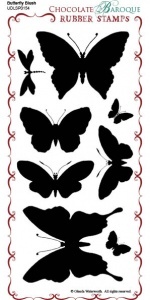 This rubber stamp set contains the same 8 butterfly image that appear on the 'Just Butterflies' set except these are solid. This is a great set for trying the "kiss stamping" technique or why not try creating your own backgrounds and incorporating some of the images from the other set. If you make no further choice, you will be sent your stamps as an unmounted sheet which you need to cut up yourself before you can use it. This is the cheapest option. 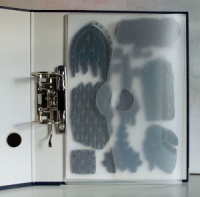 If you want to mount your stamps onto self cling cushion, we recommend Cling-a-ling and Tonic non-stick scissors. Take advantage of our cutting service and receive your stamps mounted onto Cling-a-ling with all individual stamps cut out. There is a higher charge for this service and we ask you to allow 2-3 extra days to prepare your order, longer if you are ordering lots of stamps. I really liked the layering idea with these stamps. You can also use them on their own with various mixed media. Great. This stamp set is outstanding, every time you use it the image is different and when used with the matching detailed 'Just butterfly' images you get a completely different effect.